The windows have been ordered. I finally confirmed a colour. It is similar to this shade of taupe. Lighter and warmer than the dark grey I was leaning towards. 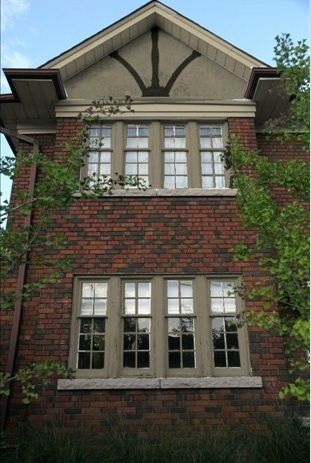 The colour works with the brick, and it compliments the stucco on the back of the house. The salesman came over on Friday to help me finalize the decision. He brought with him an additional set of colours that I hadn't seen before. I went with my gut - it said this colour was the one! Hopefully, in 6 to 8 weeks, I will be able to show you the real thing! I think this is the last major upgrade! We have nothing left to renovate after this! We are also officially done decorating, but that won't stop me from making small improvements*. I guess it's time to move onto the next stage...what is the next stage? We want to stay in this home another 5-10 years before we pack up and start over! Let's see where we go from here! *I still want mirror inserts on the front of the closet doors in the master bedroom. I have tried to get the two glass guys we used before to give us quotes, but the one only works with contractors, and the other never called us back. I also want to paint the basement bathroom vanity black. I actually can't wait to do this! I would love to change the stubby kitchen shelves. I still want a reclaimed wood shelf in the bar area to cover up the seam. Black out drapes are a must in the nursery (they have been ordered). We also have to paint the front exterior, garage, deck, and seal the driveway. This is going to look awesome! Can't wait to see more! Seems like a fabulous decision to me. Looking forward to the "after" photos. Thanks J! I can't wait! I dunno Sandra...we are pretty set on NEVER reno'ing again. Famous last words??? I went for a walk with the baby today and I think 128 heddington Avenue has the same brick as yours and it looks great with taupe. Check it out! If it is the same taupe not 100% sure.